A Greek rice pudding, which is eaten cold from the fridge. 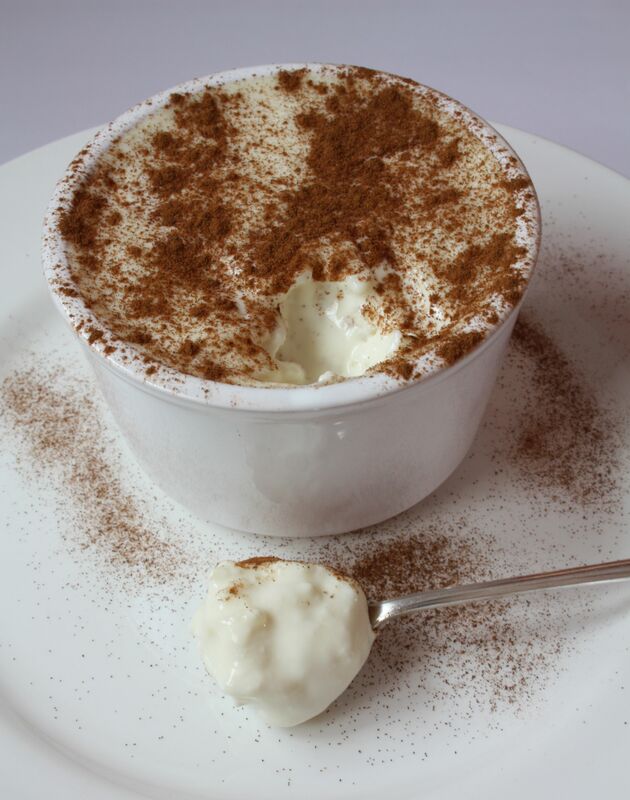 It has a creamy light texture and is delicious sprinkled with cinnamon. In fact I think the cinnamon has to be compulsory if you really want to enjoy this jewel of a pudding. I say pudding but I have always eaten it for breakfast. As a child I was told that I would have to eat something at breakfast and the choices were not great. I didn’t fancy what was on offer – so every morning started off with a battle of wills. The grown ups tried coaxing, then shouting and just when they were at the hair pulling out stage someone made the suggestion of rizogalo. It had milk in it so it had to be good for small children. A pot was fetched, delivered and eaten. Calm had been resumed. Everyone happy. So from then on, every morning someone in the kitchen would be sent out to buy a single pot for my breakfast (I imagined they hated me!) It would arrive on the breakfast tray each morning and without a murmur from me it would be devoured. It was the highlight of the day. Over the years it must have become a real chore because abruptly one morning no one would go out for it, they all were too busy. So even though I was older the same old stressful morning routine started up again. The solution was easy, I would take matters into my own hands and get up a little earlier and take myself off to the shop to buy it myself. This was the first task I was ever allowed to do on my own and I loved the freedom and importance of making a purchase all by myself. The shop that sold the rizogalo was further down the road and it was slightly different from the other shops, it had a tree right outside which created shadow over the interior. It was run by an elderly couple who were happy with their lot, they had no intention of expanding their empire, they had their regulars who would spend hours discussing the woes or joys of the day and time seemed to have stood still for them. I think it amused them that I came in person to collect my morning order, no doubt they knew all about me before I had even entered their shop. The large fridge sat to the side of the shop and it would be packed full of opaque pots filled with creamy rizogola. I would wait by the fridge for one of the couple to come over, open it, and take out the little pot of rizogalo. They would ask if I would like cinnamon on top and before I could answer, a large steel sifter would deliver a heavy coating of cinnamon. This was then tightly wrapped in a small piece of printed paper and exchanged for the money held in my hot little hand. Rizogalo was the start of my liberation! This is a good recipe to use up the last of the aboria rice. The beauty of this recipe is that you can alter it to your own taste, either with more rice or less sugar but do not change the milk to a lower fat milk or you will lose the richness. 2 pints/1.13 Litres Gold top/Jersey milk (full fat) If I can’t find a high content milk I add a little double cream. Put the milk into a pan and bring slowly up to a gentle simmer add the washed rice and sugar stirring all the time. If left, it will catch and burn on the bottom of the pan. Once the sugar has dissolved turn down the heat and let it gently cook for 45 minutes. Returning to the pan often to stir. Taste, if the rice is soft then mix the cornflour with a little cold water until smooth and add this to the milk pan. Continue to simmer whilst stirring. When you have the thickness you want remove from the heat allow to cool and put into glasses or dishes and put in the fridge for a couple of hours or until chilled throughout, overnight is fine. It is best eaten chilled with a liberal sprinkling of cinnamon over the top. Hahaha, Maria I so enjoyed reading the story behind your pudding breakfast! 🙂 I have a recipe for rice pudding too, it is my mom’s from the ’80s and it is a little bit “tweaked” from the traditional standard but you should definitely try it! I shall! I think every Greek home has their own recipe for this, its the sort of recipe that needs ‘tweaking’ to your own tastes too. I don’t think I have tried it with condensed milk, no doubt that is what would add the richness to your recipe. A wonderful memory and an appealing way to serve a healthy breakfast. Thank you Kathleen. It certainly tastes better than a lot of breakfast cereals. A wonderful story, Maria. Love how rizogalo was your “liberation.” Cute but very true! I’m going to share your recipe with my Zia, who happens to love rice pudding. I think she’ll appreciate an Old World recipe and will surely give your recipe a try. Thanks for sharing. Thank you John. In those days I wasn’t allowed anywhere by myself, I don’t know what they were afraid of. I do hope Zia tries it and more importantly enjoys it. Lovely post, Maria, and the pudding looks delicious. That’s my kind of breakfast! Love anything with cinnamon and it is supposed to have health benefits too. Not sure I could eat this for breakfast. I would prefer as a pudding, perhaps with some fresh strawberries or raspberries. Thank you. It tastes pretty good too!